Mercury in Pisces is in a mutable water sign and takes on the qualities of its ruler Jupiter, expansive, visionary and boundless. On the upside, people with this placement tend to think through things in non-linear or associative ways, making connections that only seem absurd or irrational to others. However, people with this placement can have difficulties distinguishing fact from fiction, reality from imagination. They’re often interested in spirituality, mysticism, religion, music and animals. When they encounter a problem, they’re likely to find the answer in something completely unrelated, or in a dream. 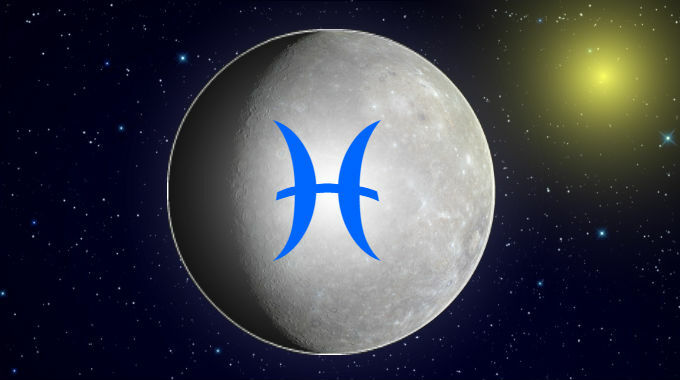 Mercury in Pisces is more empathetic and less detail-oriented, so they are sometimes better at counseling and talking through less tangible issues and topics. They’re probably tickled most by surreal humor, nonsense and silliness. This is especially true if you were born with Gemini, Virgo or Pisces rising. Whether you experience the better or worse significations of this position depends on Mercury’s relationship with the Sun and whether you were born during the day or at night, and the kind of aspects it makes with the other planets.